It’s nice and cold in most parts of the country, so you know what that means, right? It’s hockey season! Today’s GladiatHer to Watch takes the sport to a new level. 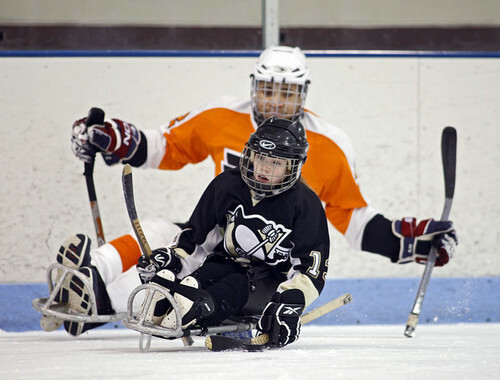 Kelsey DiClaudio is a teen sled hockey phenom. What’s sled hockey? It’s a modified form of hockey for people with disabilities that DiClaudio, an athlete with spina bifida, has conquered since she was eight years old. By the time she was 14, DiClaudio was one of the star players of the nationally ranked, all-men’s Pittsburgh Mighty Penguins. In addition to being a force to be reckoned with in men’s leagues, he’s now a member of the recently formed national women’s sled hockey team which hopes to soon make an appearance in the Paralympics. DiClaudio’s passion and talent is propelling her to the forefront of a sport that’s sure to make an impact in women’s sports.